Wasn't this the kind of thing that the DHARMA Initiative was playing with on that mysterious Island? We all know how great that turned out, huh? Some thinkin' dudes at Cornell University have torn a hole in time itself. 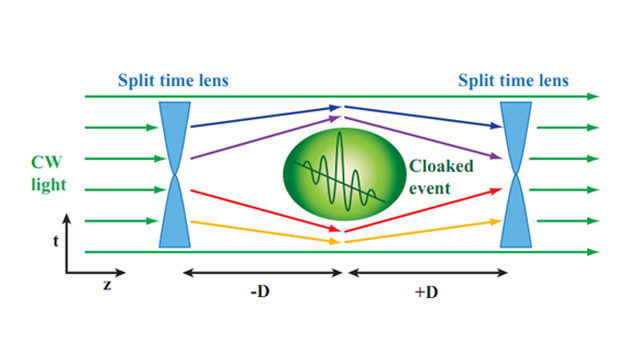 The result is a "time cloak" that hides events from being observed by the rest of the universe. The process relies on similar methods of distorting electromagnetic fields as invisibility cloaks, but it exploits a time-space duality in electromagnetic theory: diffraction and dispersion of light in space are mathematically equivalent. Scientists have used this theory to create a "time-lens [that] can, for example, magnify or compress in time". 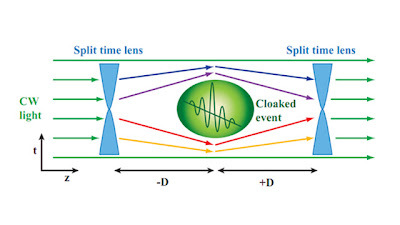 The time cloak takes two of those lenses and arranges them so that one compresses a beam of light while the other decompresses it. That leaves the beam seemingly unchanged, but the diffraction and dispersion actually "cloak" small events in the beam's timeline. Right now, the cloak can only last for 120 nanoseconds, and the theoretical max for the current design measures just microseconds. But the prospect of being able to exist outside of time, even for just a few microseconds, should be enough to make even the most jaded tech nerd giggle at the possibilities.